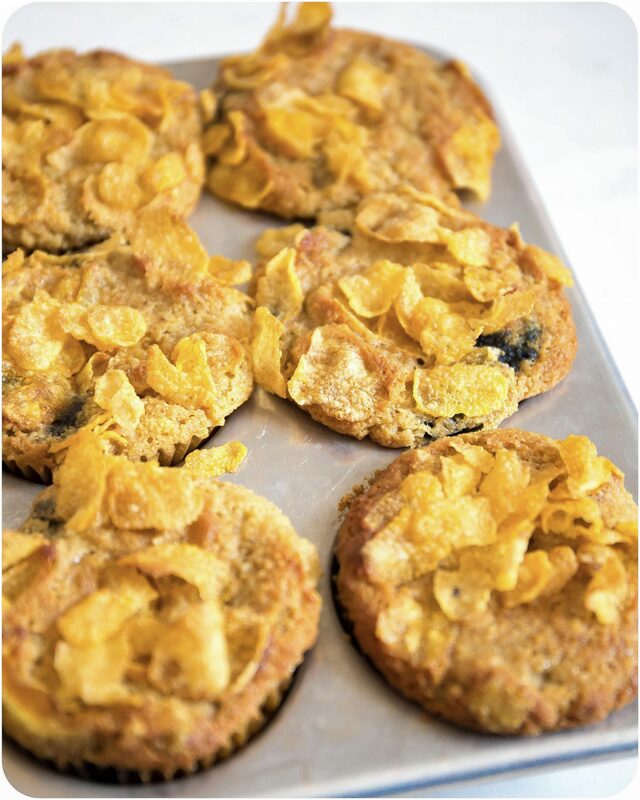 I saw some Blueberry Cornflake Muffins when I was working in a cafe earlier this week and I was immediately struck—the crunchy cornflake topping looked so good. I bought one, but when I took a bite, I was disappointed—the muffin was super dry, and the cornflakes on top were soggy. Still, the seed was planted. 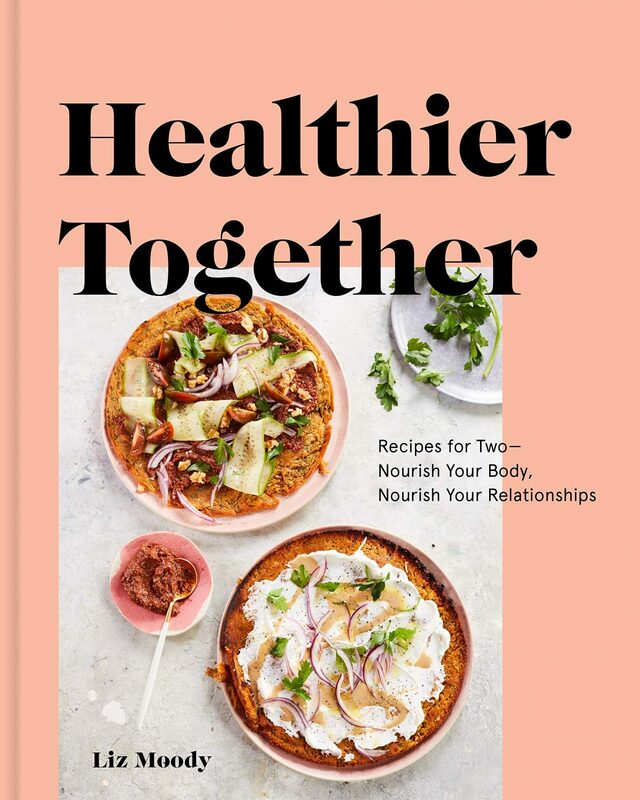 When I couldn’t get them out of my head later that week, I started tooling around in the kitchen to create a healthy version, and oh boy, did I succeed. These are crazy moist, just the right amount of sweet, and crunchy and savory from the corn flakes on top. 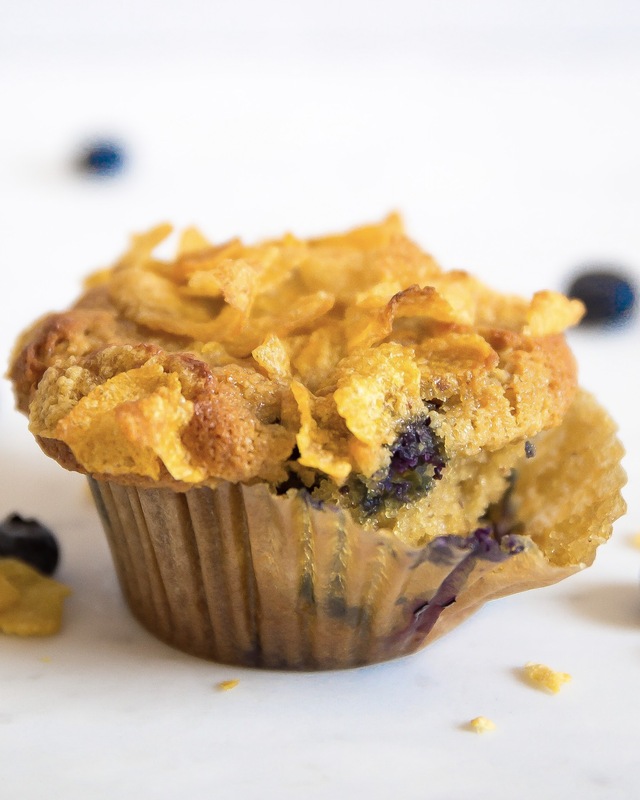 Lightly sweetened with honey, and studded with bursts of blueberry, these muffins channel a breakfast cereal vibe—but unlike most breakfast cereals, they won’t spike and crash your blood sugar, leaving you feeling hangry well before lunch. 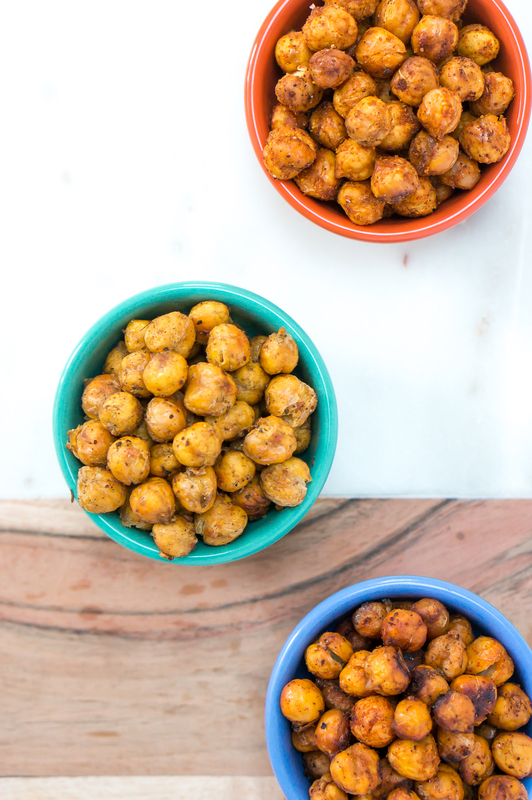 They’re also almost grain free, but the corn flakes on top keep ’em from being all the way there–and you know what? I’m okay with that. If you want some grain free blueberry muffins, just make a batch without the corn flakes. 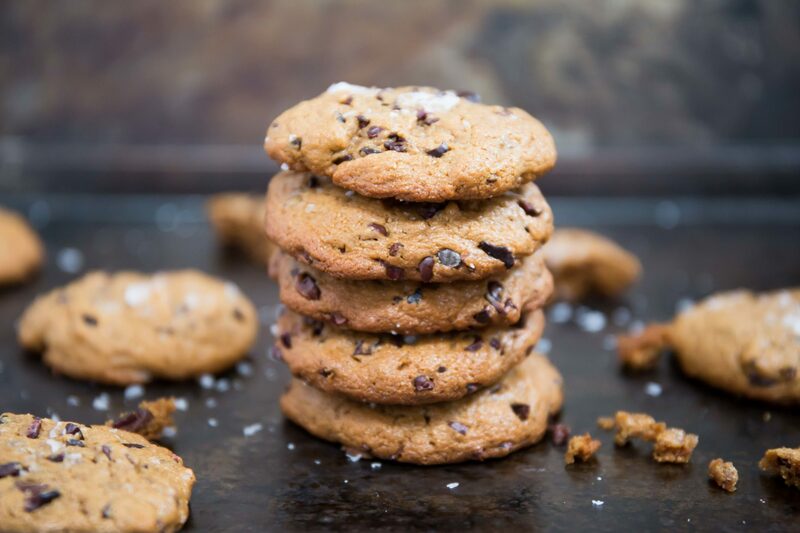 They’ll still be super delicious, but I was vibing on corn flakes and I love the result—and above all diet rules, I’m all about eating what you absolutely love. A few notes on the corn flakes: Most corn flakes aren’t indeed gluten free, because of the malt used in the syrup that coats the cereal. Read the box, or go for Arrowhead Mills fruit juice-sweetened Cornflakes or Erewohn Corn Flakes, both of which certified gluten-free. Nature’s Path Honey’d Corn Flakes, which are sweetened with honey, are a great choice as well. A few other fun things: I read an amazing Serious Eats article that debunks the whole “tossing berries in flour keeps them from sinking to the bottom of baked goods” trope. Apparently, the best way to keep your berries from sinking is just to simply spoon a bit of non-berried batter into the bottom of your pan or muffin tin, then mix the berries in and pour the rest of the batter on top. The first bit of batter acts as a buffer to keep the berries from sinking. I’ve been trying it recently, and it works so well. Finally, I often find almond flour baked goods to be a little too dense, so I added a splash of apple cider vinegar to help activate the baking soda, which gives lift to these muffins. The result is light and airy, but still rich and moist (sorry if you’re one of the people who hates that word, but they are!). Tag me on Insta if you make them—I can’t wait to hear what you think! Preheat oven to 375 degrees. Line a muffin tin with 12 muffin liners. In a small bowl, toss the cornflakes with the 1 tablespoon of avocado oil until well coated. Set aside. In a large bowl, stir together the almond flour, baking soda, salt and lemon zest until well-combined. Stir in the honey, eggs, and 1/4 cup of avocado oil and stir until homogenous. Stir in the apple cider vinegar; stir well. The mixture will foam a little bit—that’s okay. Add a spoonful of the batter to the bottom of each muffin cup (this prevents the blueberries from sinking to the bottom). Stir the blueberries into the remaining batter, then fill each muffin cup until it’s 2/3 full. 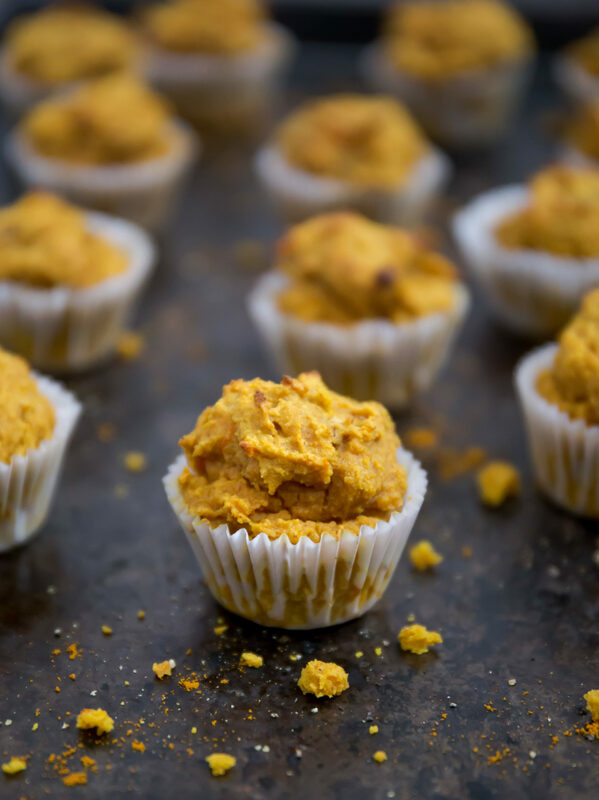 Top each muffin with a generous amount of corn flakes. Bake for 25 – 30 minutes, or until the top is golden brown. Let muffins cool completely before removing from pan.